What makes Odysseus a classic Greek hero? 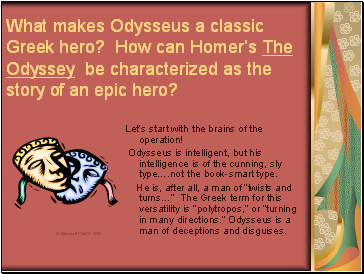 How can Homer’s The Odyssey be characterized as the story of an epic hero? Let’s start with the brains of the operation! 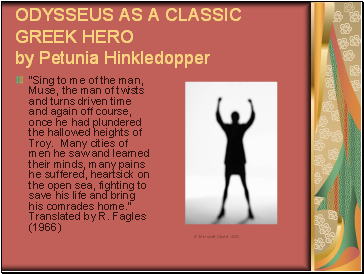 Odysseus is intelligent, but his intelligence is of the cunning, sly type….not the book-smart type. He is, after all, a man of “twists and turns…” The Greek term for this versatility is “polytropos,” or “turning in many directions.” Odysseus is a man of deceptions and disguises. 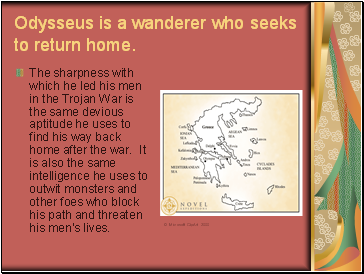 Odysseus is a wanderer who seeks to return home. The sharpness with which he led his men in the Trojan War is the same devious aptitude he uses to find his way back home after the war. It is also the same intelligence he uses to outwit monsters and other foes who block his path and threaten his men’s lives. Odysseus mocks reliance on strength alone. Strength without cunning is what dooms the suitors to Odysseus’s deception. Odysseus cuts his losses to Charybdis and Scylla through careful navigation. 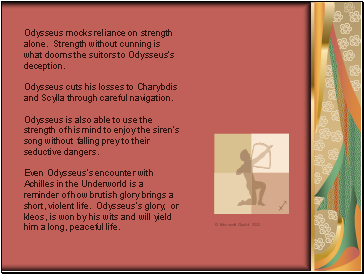 Odysseus is also able to use the strength of his mind to enjoy the siren’s song without falling prey to their seductive dangers. Even Odysseus’s encounter with Achilles in the Underworld is a reminder of how brutish glory brings a short, violent life. Odysseus’s glory, or kleos, is won by his wits and will yield him a long, peaceful life. 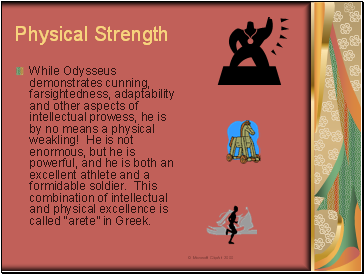 While Odysseus demonstrates cunning, farsightedness, adaptability and other aspects of intellectual prowess, he is by no means a physical weakling! He is not enormous, but he is powerful, and he is both an excellent athlete and a formidable soldier. This combination of intellectual and physical excellence is called “arete” in Greek. 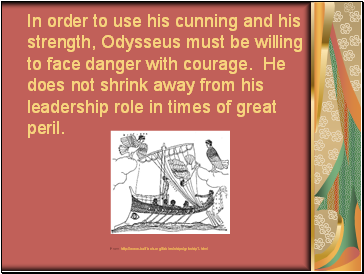 In order to use his cunning and his strength, Odysseus must be willing to face danger with courage. He does not shrink away from his leadership role in times of great peril. A few notes on his atypical status…. Unlike heroes such as Beowulf who search out the dragon and the danger…. Odysseus has a voracious appetite and a mortal’s weakness for comfort.